Unfortunately, as time would have it, we were able to do very few winter walks on Cape Cod this year. We were able, however, to see a few new sites and revisit some of our old favorites. Our goal this year was to check out some of the areas on the Upper Cape, as we had really focused on the Lower Cape (towards Provincetown) in winter 2014/2015. One of our first walks back in February was the Maple Swamp conservation lands in Sandwich. It was a bit hard to find – the sign for the site was facing opposite of the way we were driving, so we drove right by it. I have to say that the most interesting thing about this walk was seeing all of the homes along the service road that parallels Cape Cod’s Route 6. There is a whole community there that I never knew existed. When I would ride along route 6 by this area I always assumed it was bordered by woods – but beyond that thin veil of trees in Sandwich is a large group of homes – it really feels like a suburb. The Maple Swamp conservation area was not the prettiest or most interesting walk, in fact it seemed to be used mostly by dog walkers who had left their souvenirs, which was unfortunate. That said, it was not unpleasant, if rather devoid of noticeable wildlife perhaps due to the heavy foot traffic there. 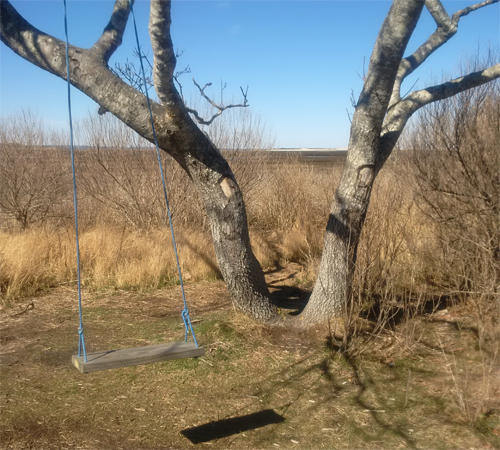 The Scorton Creek area in Sandwich has a beautiful marsh view – you almost feel like you could walk out to Sandy Neck in minutes, the view is so clear. I highly recommend this walk, it’s clean, peaceful and pretty. A lonely tree swing adds to the serene, dreamlike mood of the place. This is a good area to spend a couple hours exploring, as close by is the Old State Game Farm and the Nye Homestead. We decided not to walk the trails on the Old State Farm on this particular day, as a horde of dog walkers had descended on the parking lot. The Nye Homestead is owned by the Thornton Burgess Society, and has a great little museum, jam shop and gift shop which we enjoyed visiting the year before. We have yet to finish all of the walks in Beth Schwarzman’s “The Nature of Cape Cod” book, although undoubtedly there will be a few we may miss as some sites are more geared to boaters or kayakers than walkers. Her suggestion of the Quashnet/Moonakis River site (Mashpee and Falmouth) was quite nice. 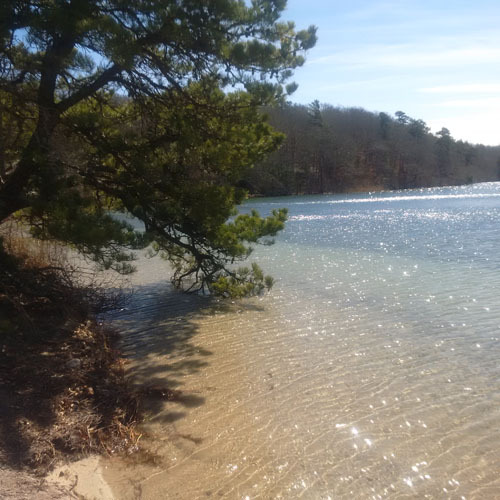 We walked around part of this area located at John’s Pond, after parking at the Mashpee Town Beach and then continued on an unmarked trail which ended up being much more of a time commitment than we had thought. Perhaps we will visit there again. I got some beautiful images of the pond. They stock the pond with fish, and a few men were hoping to get a bite on this unseasonably warm March day. Gray’s Beach is our usual biking destination, we had never actually walked the wooded trails that this area offers – so we decided to check it out in late March. Although it goes through a small residential area, this path was quite beautiful, with scenic footbridges and a nice view of some of the taller buildings on 6A. The only thing I disliked about this walk was the fact that someone had dumped several pieces of furniture marring the scenery in the beginning of the trail area, which was quite shameful – I imagine our tax money will be used to clean this soon if it hasn’t been done already. (Thanks for dumping in a nature trail to save a few bucks idiots.) Note: We got a little lost where the path entered the residential area, not knowing quite how to get back on the path we ended up starting at a different point completely. So expect to do a little exploring, potentially through what seems like private property, on this trail. The name for the area is Chase Garden Creek or Callery-Darling Conservation Area. If you see one place on Cape Cod – at least on Mid Cape – the views of Gray’s Beach are gorgeous, especially at sunset. I don’t recommend the beach itself, although it definitely draws a crowd in the summer – as little black biting flies – no matter what the month in summer – descend in droves. It’s flies like that that make me relieved I don’t have a home there – although this neighborhood in Yarmouth Port is absolutely gorgeous. Also, Greenheads, even worse biters than the black flies, make an appearance for a good (pardon the pun) chunk of the summer every year. The “chunk” pun refers to the fact that Greenheads don’t sting, they bite a chunk out of you – a topic which never fails to terrify guests. One particular weekend in early April we felt like re-visiting an old standby – we wanted a longer walk to a place where we knew we would be rewarded with gorgeous scenery – so we revisited Bridge Street conservation area in West Barnstable. No deer this time, but we had a total of 5 ticks between the two of us upon finishing this walk – it’s reputation of being very ticky there stands true. As Beth Schwarzman says of this short hike: “This isn’t the forest primeval, of course, but this large area of unbroken woods can give you a sense of what this country looked like before Europeans arrived.” We certainly enjoyed the peace and quiet this 1,100 acre conservation area provided to us. This is a walk I would definitely avoid in the summer – it does get overgrown especially if you hit it during a time they haven’t cut back the path – which gives the ticks lots more opportunity to snack on you. We had just about 45 minutes on one weekend day in early April so we took the opportunity to revisit the Yarmouth Historical Society nature trails in Yarmouth Port which is 60 wooded acres along a pond about 1.5 miles behind the Yarmouth Port Post Office, on Route 6A. This short walk, not mentioned in Shwarzman’s book but something we came across from driving by, never disappoints. Get down in nature, down in the water and the dirt. Between the indoors and the sky innumerable possibilities are lost. We endanger the natural environment partly because we have made so many signs for ourselves, invented the means for so many accelerated directions, cut so many corners, that we have almost forgotten how to converse with it. And our greed for applications and appliances tends to make us forget that it was the search for truth and not its substitutes that made them possible in the first place.